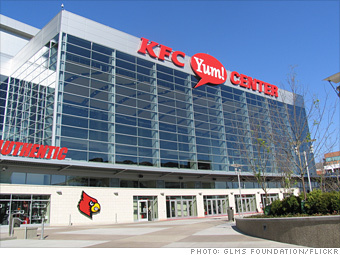 One of the most recent deals is Yum Brands' sponsorship of the University of Louisville basketball arena, which opened in 2010. Though the deal is relatively small -- KFC paid $13.5 million over ten years--it's an example of smart marketing, says Dan Neely, founder and CEO of Networked Insights, which helps companies monitor social media to improve their brand strength. "Yum as a brand has this cool emotion -- it reminds me of going to a stadium and getting a hot dog or something," Neely says. He adds that Yum! is also based in Louisville, and that kind of connection to the community can strengthen brand recognition for consumers. It's an added bonus that basketball fans will have Yum's products on their minds, and maybe in their mouths, when they're watching the games, Neely says. Besides KFC, Yum! also owns Pizza Hut and Taco Bell, and all three chains will be part of the arena's concession stands.